Our new lower cost gen 2.5 SKS KwikRail is made to our exacting specifications in order to bring you an excellent product at a low price point. The rear bracket mount has been extended forward in order to add stiffness to the rail. The other important features of the Premium Grade KwikRail remain the same. With removal of the rear pin the KwikRail pivots up and out of the way for easy cleaning and maintenance. Equipped with a groove for use as an emergency back-up iron sight. Front sight will require some adjustment. 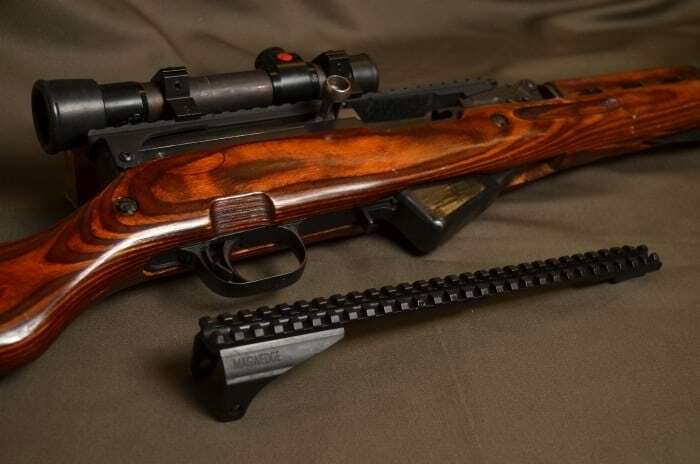 Requires removal of rear sight and receiver cover pin from your SKS. All new hardware is supplied with KwikRail. Our gen 2.5 KwikRail is produced with die cast aluminum, and finished with a business like matte anodize. MagWedge SKS KwikRail gen 2.5 – Our new lower cost gen 2.5 SKS KwikRail is made to our exacting specifications in order to bring you an excellent product at a low price point.